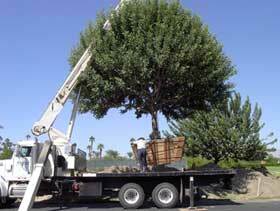 We have the knowledge, tools, and equipment to box and relocate existing trees on site or move them to a new location. 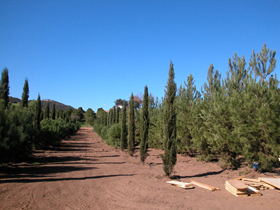 With three generations of specimen relocation experience La Cresta can provide you with quality relocation services on projects as small as one or two trees or as large as two to three hundred trees. Some landscapers do not have the equipment to handle the larger specimen trees. At La Cresta we can provide assistance in this area. Having our own fleet of large equipment we can dig the hole, set the tree, and even plant it. Each of these services is available if you have the need. We would be glad to help. We have the qualified staff to properly maintain boxed material either on or off-site during its storage period before replanting. By setting up temporary irrigation systems and having qualified personal monitor the water levels and fertilizer needs, we are able to maintain the tree in good health during its relocation period. In addition to the watering and fertilizing needs our maintenance staff also turns in a weekly report on the status of the tree which is available at the customer’s request. When considering a large tree moving project tree evaluation should be done. La Cresta Tree can help. Our staff can number and evaluate the trees on site, make recommendation on sizing, suggest which trees are viable and cost effective to move, prepare a detailed report on the project, and provide a proposal on the project. With an on staff Arborist we also offer consultation on projects or tree assessment. An arborist is a person with multiple years of horticultural experience who has been certified thru the ISA or other arborist affiliation by field experience, schooling, and exams as an expert in the field of horticulture. An arborist can give recommendations in areas such as tree evaluation, tree biology, disease, construction impact, water and fertilizer needs, pruning, and several more areas dealing with trees and plants. 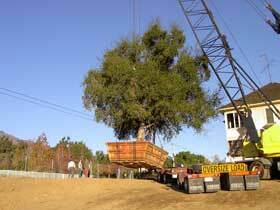 The Oak tree in this photo was moved at a private residence in Irvine, Ca. The box was a 120” box weighing approxamitly 37,000lbs. This tree was moved to make room for construction, maintained on site, then replanted in it’s new home. One of our growing grounds in San Marcos, CA. All of our specimen material is field grown and then boxed out of the field as it becomes ready for the size that is required. This photo is of the relocation project at the El Dorado Country Club in Indian Wells, CA. This project involved several large trees that were relocated due to redesign.